Dr. Murray’s team of volunteers, ready to treat patients. Dr. Murray and an assistant working on a patient. For most people, going to the dentist is like pulling teeth. While they might not take advantage of the chance, they at least have the opportunity. There are several members of the community who aren’t as lucky and as a result, they are left out in the cold. 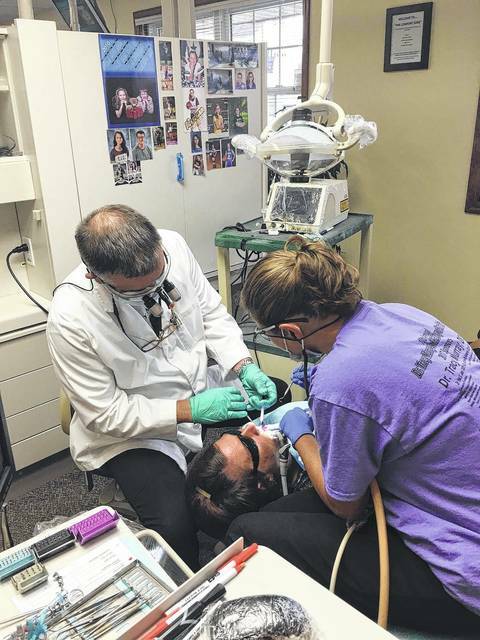 Fortunately, local resident and dentist, Dr. Tracy Murray, has been doing his part over the last decade to help local residents. The free day of dentistry this year was held July 22. With the help of Dr. Andrew Mullendore, from Columbus, and Dr. Hal Jeter, from South Point, as well as 10 volunteers — more than $25,000 of free extractions and fillings were provided to treat 57 patients throughout the day. According to Rhonda Murray, the event keeps growing every year. While the office staff of Dr. Murray shows up every year, former employees continue to show up to lend a helping hand. “It’s just a good day. It’s our way of showing that there are good people in the world that want to give back for everyone that tries, for people that don’t have insurance or that doesn’t have the funds for dental treatment,” Rhonda Murray said. “We just basically want to help people that need it. While they technically don’t get paid for the day, Rhonda Murray said some of the patients are so grateful that they tend to bring in thank you items the next week, which might include goodie bags or fresh vegetables from their gardens. Even the local business get involved in the free day, often catering. This year, Toro Loco, Giovannis, Fred’s Pizza, Mexitali, Subway and The Ribber donated food for the event.